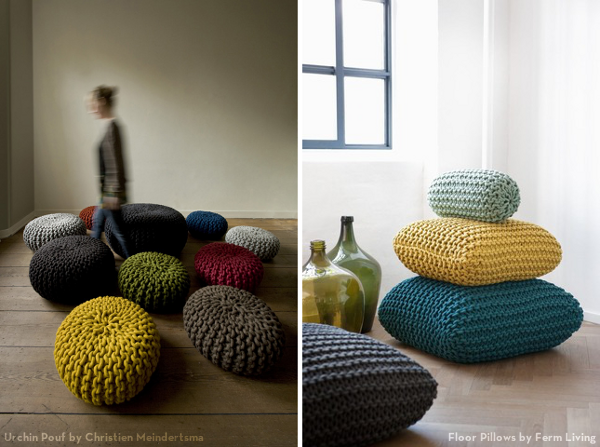 Hack together a knit floor pouf with heaps of fabric yarn, a rattan floor pouf from IKEA, and this tutorial. Okay, so I don't know exactly what you'd do with a bunch of knitted candy corn, but I'm willing to figure it out. Gifts? Table top decor? Dog toys?! Studio Beelden Bouwers thought it would be a good idea to re-use old sweaters by turning them into lampshades. They were right. For knitters or crocheters, customizing shapes for lampshade slipcovers would be a snap. Pieced together with a blanket stitch....hmm. From 3rings. You know those heavy duty plastic bags that duvet covers, quilts, shams and etcetera come in these days? One way they can find a second life by keeping your yarn stash tidy. If you currently keep your yarn stash in a big plastic storage container, you know that the individual balls or skeins find a way to become a tangled mess in no time.You reach in, dig around, balls unravel. We've had teeny tiny knitting and now we have ginormous knitting. Just in time for spooky Halloween crafts, Bernat has introduced their new worsted weight glow in the dark yarn. To make your photo-luminescent experience even more fun, Bernat also has some free knit and crochet patterns to download like the knitted 'boo' bag pictured above the glowing crocheted star below. Tipnut has assembled the ultimate list of homemade Swiffer Cloth Patterns. Some you sew, some you crochet, and some you knit. Knit Your Own Doctor Who Scarf. Pop culture figures often come with their favorite accessories: Twiggy's eyelashes, Kojak's lollipop, and for Dr. Who, an impractically long multicolored scarf. Who fan Chris Brimelow offers a how-tos and patternsfor knitting your own. Make a Super Mario "Goomba" Beanie. I was fortunate to snag a Nintendo Wii when I was out of the country (still not available in the U.S., right?) and I'm finally building some Wii-mote skills on the marvellous Super Mario Galaxy, which is everybit as fun as Super Mario Brothers for the NES. And it includes plenty of these goombas for the smashing, but thankfully none of those ducks with the turtle shells. Grab the goomba hat pattern here.